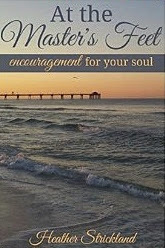 Heather Strickland has just the thing – At the Master’s Feet: Encouragement for Your Soul. Heather’s 30 day devotional is like having a conversation with a friend. Her honest, warm words point to Christ, helping you focus on Him each day. Heather and I became friends through Friday’s Fave Five, a meme that encourages you to name your five blessings of the week. I got an excited message from her when she began her eBook journey, and we kept in touch throughout the process. Listen in while Heather shares her writing journey. Why did you decide to write an eBook? When I was a teenager, I dreamed of writing a book. God put the desire in my heart, but at that time I had no clue really how it would all work out. I was still young and just dreaming. I began to mature more as a Christian after I was married. God began to really teach me some things, and it wasn’t easy at all. After a few years of being married and becoming a mom, I knew it was time to start writing that book. An eBook was something I knew I could do without having to get an agent. It was most practical. And the exciting news is that my eBook is in print, too! Last year I started writing an outline and knew it would take some time for the book I wanted to unfold. Meanwhile, God nudged me to write a devotional. I had just started writing devotions for two online ministries, so it was perfect. My friend, Ashley Wells, posted on Facebook about an eBook challenge, so I messaged her about it, and it took off from there. I was in a class called "31 Days to Write Your eBook." I learned to not be afraid. I have always had a fear of rejection. This process was a big step for me. I had fears of being rejected, and writing a book is very intimate—especially if you share any personal information in it. I learned that even when trials come in the midst of doing something great, you must press on. We have to persevere no matter what comes our way. If someone out there is thinking about the process, what would you recommend they do? If you’re self-publishing, find a great support group. I had my husband and several friends who were supporting me in real life, not to mention my friends online. Ask around on social media about an eBook coach that can help you with the process. Ashley was wonderful in helping me accomplish my goal. If you know what you want the book to be about, go ahead and write an outline. Then follow the Holy Spirit’s lead. What's your favorite devotion in your book and why? My favorite devotion from the book is "Day 8: When We Are Weak." I love it because God works through us even though we are weak. He loves to do the impossible through His children to show His might. Mississippi born and raised, Heather Strickland is a stay-at-home wife and mother with a passion to encourage others through writing. God planted this dream of writing a book in her heart when she was a teenager, began to grow it during her early adulthood, and now - with the help of many dear friends - God has made that dream a reality. She enjoys sipping coffee on her front porch, flipping through the pages of a good book, and holding hands with her love. When she isn’t serving her family, Heather blogs regularly at Becoming Titus 2 Women, Laced with Grace, and The Imperfect Wives. But her primary ministry is to her husband and three boys. Not only is Heather crazy about them, they give her an abundance of writing material. Through them, God has molded her and taught her many life lessons. Heather is forever grateful for God’s grace and guidance in her life. You may contact Heather on Facebook at Becoming Titus 2 Women or email her at the.stricklands06@gmail.com. I'm linking up today at Playdates with God and Soli Deo Sisterhood. How neat! I participated in Ashley's challenge in May and my ebook was published on Amazon just this week. I will go out and check Heather's. It was such a privilege to have your help, Laura!! Thanks for spreading the word about my book. Melissa- I would love to find your book, what's the name of it? oh i need this book!!!! thanks for sharing! Oh Jen, I am emailing you NOW!! Faith- I hope it encourages you!! You ladies are blessing my socks off!